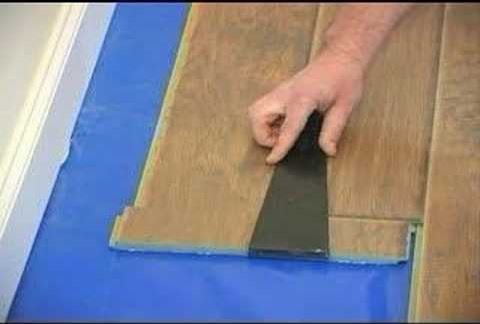 In this tutorial, we learn how to install laminate floor under a door. First, take your floor and pop it into place like you do for the entire floor. Then, take a piece of scrap and place on the end. After this, grab a tool and push it into the door with a hammer until it reaches underneath the door. Once you have this finished, it will give you a nice and clean look on your floor. Make sure you don't miss with the hammer and hit the flooring, so you don't cause cracks in it at all. To finish your flooring, add in the last pieces of laminate then you're done.